Monterey County’s Santa Lucia Highlands garnered the gold this week in the lead-up wine competition to this weekend’s annual Salinas Valley Food & Wine Festival. Four of the five gold medal winners of this year’s festival Wine Competition hail from the Santa Lucia Highlands – an American Viticultural Area, or appellation, in the western foothills of the Salinas Valley that begins north of Gonzales and runs south to Soledad. [Steve-Sustainable article Californian] Another way to describe the Highlands is to drive to River Road in Salinas, head south for 15 minutes and then look for all the vineyard signs. The appellation is home to some of the biggest names in Monterey County wines, including McIntyre Vineyards, which garnered two gold medals for its McIntyre 2012 Santa Lucia Highlands Chardonnay and its McIntyre 2011 Santa Lucia Highlands Block Chardonnay. Other familiar names, including Hahn, Talbott and Paraiso, grow in the Highlands. Other Highlands vintages awarded gold was J Lohr’s 2011 Highlands Bench Pinot Noir and the Joyce 2012 Tondre Grapefield Riesling. The only wine to earn a gold outside of the Highlands was La Rochelle’s 2012 Pinot Munier from the Russian River Valley. Silver and bronze medal winners kept the Highlands in the red, with McIntyre’s 2012 Pinot Noir, Estancia’s 2011 Bianchi Bench Pinot Noir and its 2011 Stonewall Pinot Noir, Paraiso’s Pinot Noir, and Tudor’s 2010 Pinot Noir. The Arroyo Seco AVA, located adjacent to the Highlands to the south, generated five more silver and gold medals from McIntyre, Tudor and Mercy vineyards. The judges were Wendy Heilmann, director of wine & spirits at Pebble Beach Resorts; Thomas Perez, founding winemaker of Kristi-Lynn Wine Group; Dave Eriksen, wine buyer at Carmel Valley Ranch; Dave Kristianson, Monterey Peninsula sommelier; and Matthew Peterson, sommelier at Post Ranch Inn in Big Sur. The awards will generate immediate marketing opportunities for the vineyards, with the winners being showcased at Saturday’s Oldtown Salinas festival, as well as a “Sommelier to Sommelier” letter that will be sent out to over 100 of the top wine-selling restaurants in Monterey County. The Wine & Food Festival in Salinas is organized by some two dozen directors and more than 150 volunteers. The event is free to the public, but those wanting to taste wines need to purchase a wristband good for unlimited tasting for $35 in advance and $45 the day of the festival. VIP tickets giving attendees access to a VIP Lounge are $85 in advance and $100 at the door. Artwork and other vendors will also be on hand. 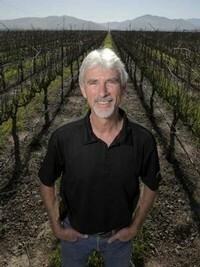 For more information on the festival, visit www.salinasvalleyfoodandwine.com . Dennis L. Taylor writes about Monterey County agriculture for The Salinas Californian. Follow him on Twitter @taylor_salnews.